Certain resume advice can cost you the interview. 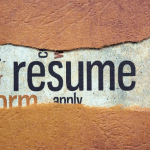 Yes, not all resume advice is sound, despite hearing it from well-intentioned professionals. Which are some of the biggest resume myths you need to avoid? While this may actually work, when the recruiter reads your keyword-stuffed resume, they will think you are spending more time trying to game the system than outlining why you are qualified. Not every company uses an ATS, but most do in some way. So while you don’t want to stuff your resume with key words, it is important to optimize it with a few relevant keywords. As a general rule, I do not go back more than 15-20 years. Even if what you did 25 years ago is applicable to what you are targeting today, no company will hire you for what you did 25 years ago. I believe, in most cases, putting 20+ years experience on your resume only dates you and does not really help your candidacy. It is never guaranteed that your resume will get read no matter how long or short it is. Keep your audience interested in five- to 10-second increments to keep the scrolling and reading. If that is one page, so be it. If that is two pages, which for most people with over 10 years of experience, is okay. A great resume with an excellent job search plan, robust network, superb follow-up skills and an amazing attitude land you a job. The most fabulous resume alone will not get you a job. A well-done resume is one piece of a process that all needs to be done well to land your next role. Join my "How to Design a Powerful Resume to Land 6-Figure Interviews and Get the Offer!" masterclass training on Tues. 4/16 or Thurs. 4/18 at 1:30 p.m. ET. You will have everything you need to land your next job fast. "See" you soon on the training!